The 4M is the MAS (Minnesota Astronomical Society) Mini Messier Marathon. It takes place annually during the fall when it's the second time of the year one can see a large number of Messier objects in one night. In Minnesota the fall marathon usually has much nicer weather; in spring, the observing field can be under a foot or more of snow, or it can be a soggy mess thanks to snow melt. The wind chill can be -25F. This year the 4M was very nice. Temperatures were in the 60s, the ground was soft but not too wet, and a gentle breeze kept the dew from forming. Mosquitoes were at a minimum--I noticed only a few, and that was only during the early evening. Clouds spread overhead at sunset and persisted until a little before 10 P.M., at which time it was a scramble to get my imaging gear going before I lost too much more time on the southern objects I was going for. 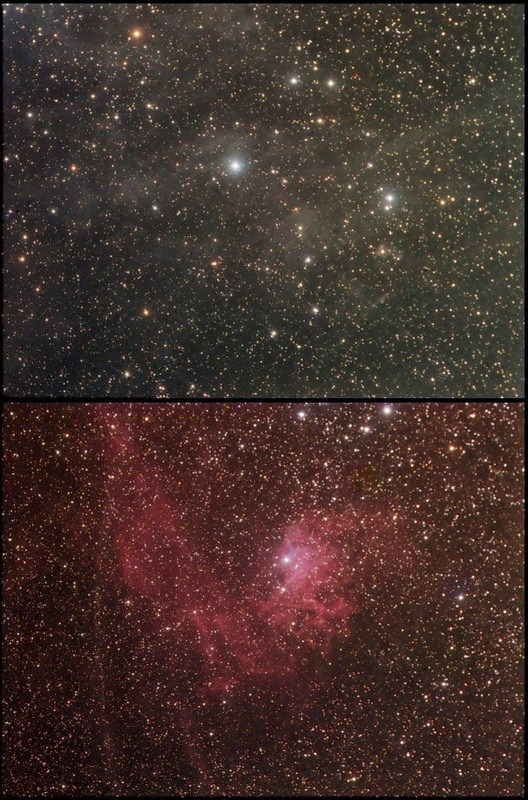 Because the transparency was poor and time was limited I opted to go for only one of my southern targets, Sh 2-46, a fairly bright (LBN brightness 3) emission nebula in Serpens Cauda. With almost no time for it I opted to image it only in luminance. I had to end imaging after 39 minutes because it was sinking into the low-altitude murk and starting to lose brightness. Top: Sh 2-46. Bottom: LBN 113. 2-46 is the unimpressive light patch just below the center of the image. 113 straddles the yellow star near the image's center. The bright blue star to its right is theta Aql. These took me to almost midnight, so the evening was still young. By that time M45 was well up, and a difficult object I wanted, IC 353, was right beside it. It didn't take long to acquire the object and begin shooting. However, I made a bad mistake at this time. The scope and camera had to move quite a bit to swing from west to east of the meridian, and in that flip the camera's sensor plane went out of orthogonality with the optical axis. Focus was no longer anything like crisp across the field, and there was some astigmatism introduced. I should have checked everything over, but in my haste I didn't. 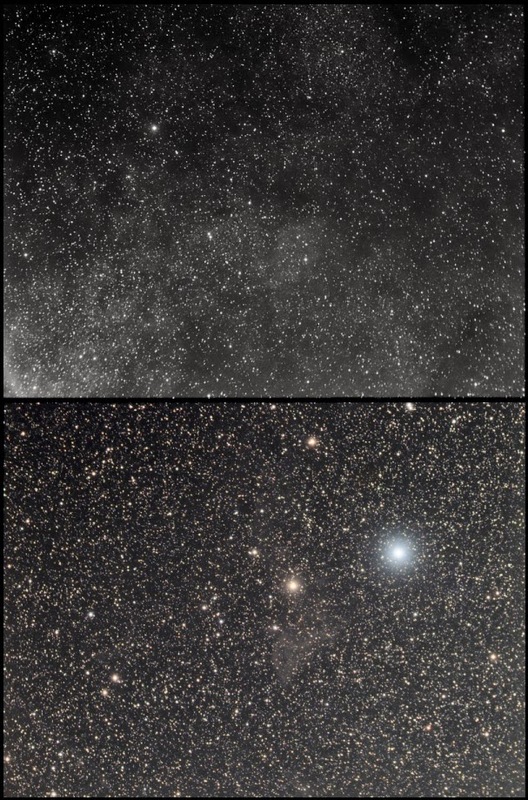 IC 405 deserves more exposure time, but that will have to wait until another night. By the time I was done with 405 it was 2:44 A.M., and I was ready to call it a night. all but a handful of marathoners had packed it in for the night by this time, so I decided to join them. Three of these are new AL Bright nebula list images for me, and the image of LBN 113 replaces my earlier attempt. I'm left with only one shaky image, in my opinion, that of Barnard's Loop. It's plainly in the image, but it could look so much nicer! What's next? The seasonal dry spell in AL Bright Nebular list objects will last for another month or so. Things really start to pick up in November. If there are some clear nights another trip to Cherry Grove may allow me to pick up some fading summer objects. Cherry Grove is only modestly dark, but it's dark enough to allow LRGB imaging.